Tortilla Soup can be a meal in itself, or served as an appetizer, either way, it’s filling, delicious and quite comforting on a cold day! Tortilla soup is a staple menu item in the southwest and you’ll often find it as the soup du jour at many restaurants from El Paso to Denton, Texas. Some versions are tomato based, but this recipe is chicken based. The beauty of this recipe is in it’s flavoring…it has complex flavors, but nothing too “over-the-top” and, you can make it as mild or spicy as you like! 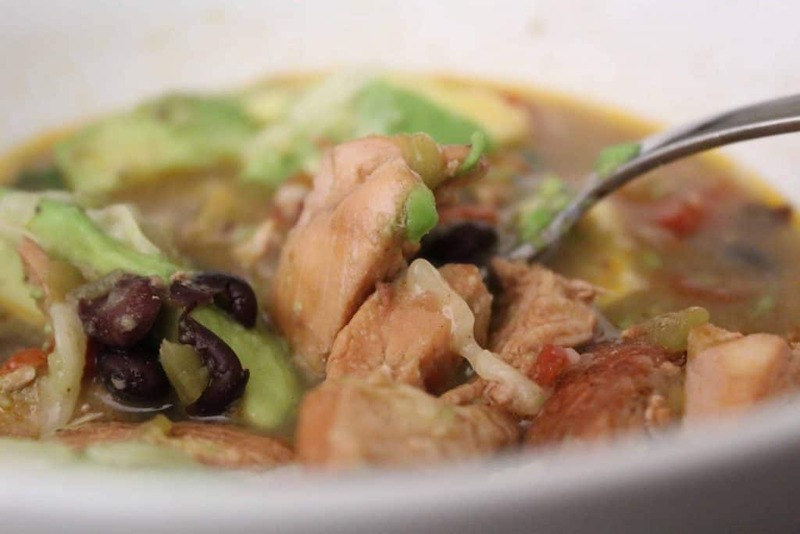 What Type of Chicken Should I Use for Tortilla Soup? I like to use a combination of white and dark. I usually use one large chicken breast and about eight skinless thighs. How Do I Cook the Chicken? There are three ways to cook the chicken. Bake, boil, saute. To bake the chicken, season it, place in in the baking dish, cover with foil and bake at 350ºF until the internal temperature reaches 165ºF. If you want to boil the chicken, just place it in water that has been salted (I’d had the other seasonings to the water, too), then cook till it has reached the safe temperature. Sauteing the chicken on the stove top is the fastest method: Cut the chicken breast into small pieces and place in a bit of oil. As for the chicken thighs, place them in the oil and allow them to cook to the safe temperature, then shred, or pull the meat off the bone. How Can I Make this Dish More Spicy? There are a few ways to spice-up this dish. You can add more chile powder or, add fresh jalapenos. Another option is to add a pepper sauce (like Tabasco), or a sprinkle of cayenne pepper. Of course, you could always add really hot peppers to this dish (think Habanero peppers) or a spicy meat like chorizo. A vegan version might use vegetable broth instead of chicken broth and obviously no meat. You could add jackfruit as a substitute for chicken. Another idea is to add mushrooms, beans, corn or carrots. Once you’ve got the broth the way you like it, you can add anything you want! Can I Substitute Flour Tortillas for the Corn Tortillas? No. Corn tortillas are made from Masa flour and have a unique flavor and texture. Flour tortillas are made of plain white flour and do not have the flavor or texture for this recipe. The flavors of the Southwest in one bowl! 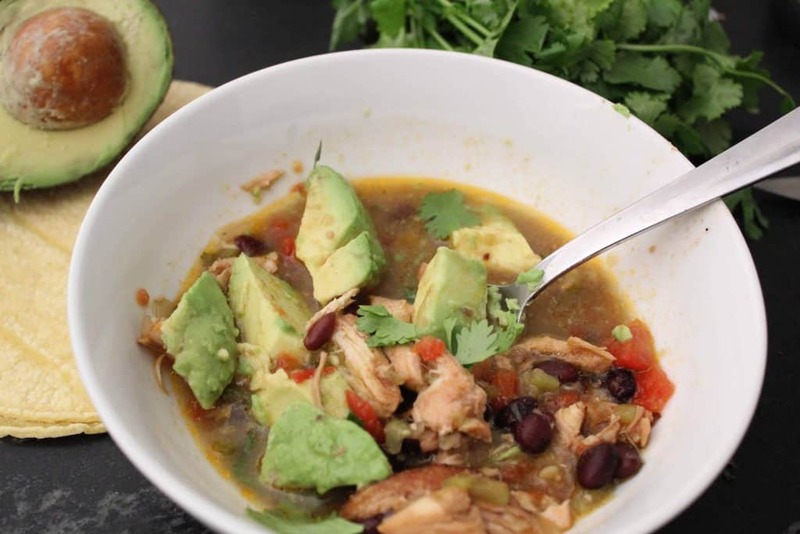 Savory chicken nestled in a aromatic blend of broth, cilantro and cumin. There are a couple of ways to cook the chicken-bake, saute or boil. If you don't have the Sazon Goya seasoning, add 1 tablespoon of ground coriander to the soup and an additional 3 torn corn tortillas; let it cook till the tortillas are dissolved, then taste. If you like it, move on. If you don't, add more coriander, salt, etc.